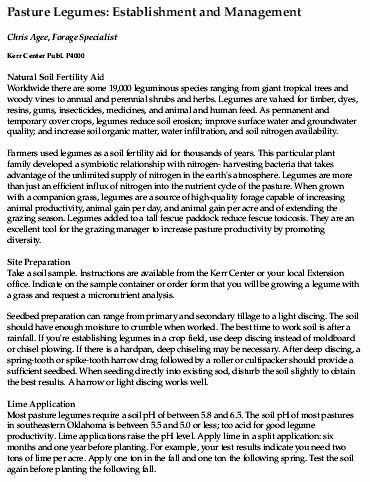 This report covers site preparation, lime application, fertilization, weed control, legume selection, seed inoculation, estimating establishment costs, grazing management, companion grasses, winter and summer annual and perennial legumes, and pasture surveying. This presentation describes goats’ feeding behavior and dietary requirements, with an emphasis on managing goats on pasture. This diagram illustrates the basic interconnection between soil, forages, animals, and weather in livestock production. This is a list of ATTRA publications related to sustainable and organic pasture and forage management. This is a presentation by David Sparks, D.V.M., from the 2008 Future Farms conference. It makes an economic case for adding goats to existing cattle operations, and addresses diet, predator control, fencing, and parasite management.